Content focus: The main guideline for including material on this web site is relevance to the interlinking of 'red' and 'green' politics, especially in relation to building the mass movement against climate change, and particularly within the Canadian state, British Columbia and Vancouver. Editorial positions: Inclusion of articles, announcements or other items does not necessarily imply agreement or endorsement. News items are selected for factual and other content to help readers stay abreast of current developments. Comments on articles by website editors reflect their own opinions. Positions of the Vancouver Ecosocialists (see below) will be signed as such. Contributions from a range of ecosocialists and others are included to promote exchange and discussion of political perspectives. Authorship and original publication: We endeavor to enable readers to readily access the original location of items re-posted on this site and to properly acknowledge authorship or other credit. We have no commercial interest in re-posting material and we will respond to reasonable requests to change if and how re-posted material appears on our site. 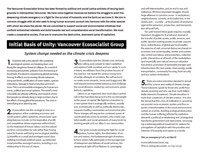 The Vancouver Ecosocialist Group has been formed by political and social justice activists of varying backgrounds in metropolitan Vancouver. We have come together because we believe the struggle to avert the deepening climate emergency is a fight for the survival of humanity and the Earth as we know it. We join in common struggle with all who seek to bring human economic pursuit into harmony with the other species with which we share the planet. We are committed to support social and environmental initiatives that confront entrenched interests and build towards real and comprehensive social transformation. We must create a cooperative society, if we are to overcome the destructive, downward spiral of capitalism. 1. Scientists tell us the planet’s life-sustaining ecological systems are breaking down and facing the dangerous threat of collapse. As a result of increasing atmospheric pollution from the burning of fossil fuels, the planet is experiencing global warming. Among its effects are increasing climate extremes, rising sea levels, acidification of ocean waters, species extinctions, damage to food production and much more. This is an immediate emergency for human economic, political and social systems. The world’s most vulnerable are already suffering, and research shows that people are already dying in large numbers due to the effects of rising global temperatures. The crisis is intensifying at an alarming rate. 2. Ecosocialists see this ecological crisis as a symptom of the underlying economic and social system called capitalism, whose basic operating features include: (1) the imperative of profit and competition-driven expansion without limit, (2) the treatment of human labour and the natural world as commodities for sale rather than having value for human well-being and ecological stability; (3) benefits to a small and privileged social class wielding inordinate political power, (4) deformed social priorities amongst humans, including in our relationship to the rest of nature. 3. Ecosocialists take the climate crisis seriously by calling upon people to reject capitalism and replace it with socialism and eco-sanity. In such a future, we will learn from the positive lessons of the past but not repeat the serious wrong turns of earlier attempts at socialism. Nor will we try to re-create some romantic, horse-and-buggy past. We look beyond environmental advocacy and challenge the social divisions created by, and economic power behind, capitalism. Labour as an organized class must play a central role in this transition because it is the counterweight to the power of capital. We fight for a transition to a new system that is ecologically resilient, socially just, economically as well as politically democratic, supports healthy communities and productive jobs. These changes will require the combined power of coordinated job action by workers, who create capitalist wealth, and social upheavals of many kinds by working people and our allies in our communities. 4. Our goals include winning the fight for social justice, human rights, the elimination of racism and sexism, the fundamental right of workers to form unions fully participate in the management of enterprises and delivery of social services, the unequivocal right of First Nations to sovereignty and self-determination, and an end to war and militarism. All these important struggles should forge alliances in common cause - in workplaces, neighborhoods, schools, at the ballot box, in the streets and – crucially – at focal points of resistance against the extraction, production, and transportation of fossil fuels. Our path toward these goals requires crucially important struggles for the halt and reversal of the transfer of public assets, public services, and public decision-making powers to private corporations; redistribution of global and local wealth; the exercise of real, universal democracy based on economic and social equality; worker and community control over labour and production; collective public intervention at all levels of the marketplace (and especially over natural resource extractive industries); promotion of renewable energies and infrastructures (for zero waste, clean energy, public transportation, community housing, food security and eco-system restoration). 5. There are entire industries devoted to denial of the science and reality of climate change. These industries speak for those who profit from climate-wrecking and who see their multi-billion-dollar interests threatened. Climate denialism is more than scepticism of climate science—it is also the denial that this crisis of civilization is caused by our present socio-economic system and thus requires a transformation in the social and economic system as a whole. Averting ecological destruction and the human suffering inflicted by capitalism demands a political re-awakening and strategy that transforms government and state power, encouraging a widening political movement to replace the prerogatives of capitalism with the priorities and interests of humanity and nature as a whole. This an emergency! Let’s act like it!